Hi friends, Here I am sharing an ebay discount offer trick. 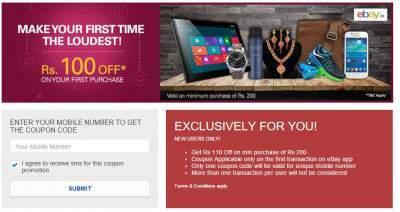 get rs 100 off on rs 200 or more shopping in eBay. This is exclusive trick for eBay new users. You need only a number so you will get your unique eBay coupon to get a discount of rs 100 off. There is a minimum purchase of rs 200 is required. so guys, read below simple steps an get your ebay flat rs 100 of on rs 200 or more shopping coupon. Enjoy shopping with eBay. I hope you guys enjoyed reading this article. enjoy online shopping with discounts. Keep visiting techintor.com for more tricks and tips. Also share articles with your friends.